100% of The Late Show’s proceeds from this book go to hurricane relief.Whose Boat Is This Boat? Comments That Don’t Help in the Aftermath of a Hurricane is a picture book made entirely of quotations from President Donald Trump in the wake of Hurricane Florence. It is the first children’s book that demonstrates what not to say after a natural disaster.On September 19, 2018, Donald Trump paid a visit to New Bern, North Carolina, one of the towns ravaged by Hurricane Florence. It was there he showed deep concern for a boat that washed ashore. “At least you got a nice boat out of the deal,” said President Trump to hurricane victims. “Have a good time!” he told them. 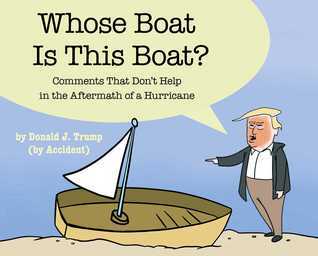 The only way his comments would be appropriate is in the context of a children’s book—and now you can experience them that way, thanks to the staff of The Late Show with Stephen Colbert.Whose Boat Is This Boat? is an excellent teaching tool for readers of all ages who enjoy learning about empathy by process of elimination. Have a good time! Yes, too short, but there is much to like--such as the ideas for future books. A fine example of making orange lemonade that aids some good causes! I expected more from the Stephen Colbert team. It’s very short and could have had more content but perhaps that would have been even more disheartening. The fact that 100% of the proceeds go to help victims of Hurricane Florence boosted my rating. It's funny until you realize it really isn't. What do you say when you don't care what you say? What do you say when you don't care how what you say affects an individual -- or even the entire world? You say the words in this book and many other disturbing words. What words do I say when I am listening to such words? Only my loved ones know. It's silly and sobering at the me time, like politics these days. It's a fundraiser for victims of Hurricane Florence. I hope this becomes a series where sound bites are formed into children's books that raise money. It's a great way to turn words that help no one, into donations that will help someone. How to comment if you have no soul!Whose Boat is This Boat? is not a book about you Donald, sorry! It is about your sorry soulless heart. His comments show he is totally unable to understand and show empathy. One of probably a few people in the world to truly lack a soul and we have him as the leader of our country! The rest are in the GOP House and Senate! Humorous and short. A lot of effort and production for really one joke but then I saw proceeds go to hurricane victims or something so that's good. Way too short. Love that the proceeds go to a good cause. Finally! A book actually written by Donald Trump! His words! All 60 or so of them. A children's book without a moral written by an amoral person. Created by the staff of the Late Show with Stephen Colbert, all proceeds go to hurricane relief in South Carolina. So there's that. "To see what we're seeing - this boat, I don't know what happened, but this boat just came here. "-President Donald J. TrumpIt's better to laugh than cry. Too sad to be funny, and maybe the execution was a little too rushed. It's not well drawn, and some of the pictures make very little sense. Too short!You mean this is the only idiotic thing that 45 said in SC??? He must have been off his game that day! You should have written a book on Puerto Rico's visit by 45 and all the doozies he said! You could have ended up with a 400-page bestseller!We do appreciate your very generous donation to rebuild the Island! Oh my. It's a two minute read but, I laughed out loud several times. As the back cover says, "It's an excellent teaching tool for readers of all ages who enjoy learning about empathy by process of elimination." Silly, stupid book that takes all of a minute to read - but an automatic 5 stars for just sticking another pin in the overinflated orange balloon that is (and I still cannot believe I'm saying this) the current president of the United States. Sigh...Every time we saw Stephen Colbert flogging this on his show, Jennifer would say "we should buy that - the money's going to a good cause;" and so we surprised her with it for Christmas. It will now take a place of honor (and probably never be looked a Silly, stupid book that takes all of a minute to read - but an automatic 5 stars for just sticking another pin in the overinflated orange balloon that is (and I still cannot believe I'm saying this) the current president of the United States. Sigh...Every time we saw Stephen Colbert flogging this on his show, Jennifer would say "we should buy that - the money's going to a good cause;" and so we surprised her with it for Christmas. It will now take a place of honor (and probably never be looked at again) next to the equally hilarious if considerably more substantial The Donald J. Trump Presidential Twitter Library. The illustrations were really clear cut and added to the humor of his odd quotes. Also in the last part, the hotdog throwing just added to how ridiculous his comments were in the wake of such a tragedy!! !Wonderful read!! It is a simple read about a simple mind that lacks empathy. All the proceeds go to charity. Humorous yet sad because the comments were all actually made in the aftermath of Hurricane Florence and show absolutely no empathy or ability to console. I mainly bought this because the proceeds are going to assist the victims of both Hurricane Florence and Hurricane Michael. And to taunt my in-laws. Ugh to the words...but definitely worth buying for a good cause. And yeah...none of those comments help in the aftermath of a hurricane. All proceeds go toward hurricane relief. Published today. Delivered today - thanks Amazon! Great election day reading. Too short. No real content. Only saving grace is that the money went to charity. I wish there was more in the book. The illustrations will have you laughing out loud at the absurdity of the text. A true story. Proceeds benefit hurricane relief. A short somewhat silly book about what not to say after a natural disaster especially by the leader of the country experiencing that disaster. Best part all proceeds go to hurricane relief. Instead of crying, Colbert helps you just laugh (this one time) at the president's words. It’s a good thing this is so short, because cringe-laughing is painful. As is reminding myself that the man who said these things is running our country. It takes a lot to eviscerate the Orange Stain that is the president in 24 pages. But taking his nonsensical statements and positioning them with simple pictures in a children’s book exposes the complete absurdity that is American politics today. A children’s book format speaks volumes more than a deep study of the insanity of Trump. He deserves simplicity because he’s simple, lacking any form of critical thought or empathy. So he’s a children’s book villain. Simplistic, one sided, and easily moc It takes a lot to eviscerate the Orange Stain that is the president in 24 pages. But taking his nonsensical statements and positioning them with simple pictures in a children’s book exposes the complete absurdity that is American politics today. A children’s book format speaks volumes more than a deep study of the insanity of Trump. He deserves simplicity because he’s simple, lacking any form of critical thought or empathy. So he’s a children’s book villain. Simplistic, one sided, and easily mocked by his own words. Yay for the Daily Show for this. Great way to raise much needed money for hurricane survivor, plus add a few smiles. When 45 and Colbert ( unknown to 45) combine to write a book did you really expect great literature ? This is a true reality show! The leader of our country said these things to people who had just had there life as they knew it destroyed.Colbert was very up front that it was short, what it was about, he even read the entire book on his show. No one was forced to buy it, jobs were produced to create it. Brought a Great way to raise much needed money for hurricane survivor, plus add a few smiles. When 45 and Colbert ( unknown to 45) combine to write a book did you really expect great literature ? This is a true reality show! The leader of our country said these things to people who had just had there life as they knew it destroyed.Colbert was very up front that it was short, what it was about, he even read the entire book on his show. No one was forced to buy it, jobs were produced to create it. Brought a few much needed laughs during a difficult time and raised money for a good cause. No fake media, no misquote , no quotes out of context just what was said. A win win deal. When you see written down some of the things Trump says, they are even more pathetic. As someone who went through Florence, thankfully with no damage, I am happy to support the charities listed that will benefit from the sale of this book. Colbert is genius! Too short. The novelty is in its existence, not the pages of the book itself. Still, it's tragically hilarious, and the proceeds are money I would have spent on donations anyway, so whatever. And I have yet another keepsake to show the next generation in my attempts to explain just how ridiculous our president was.